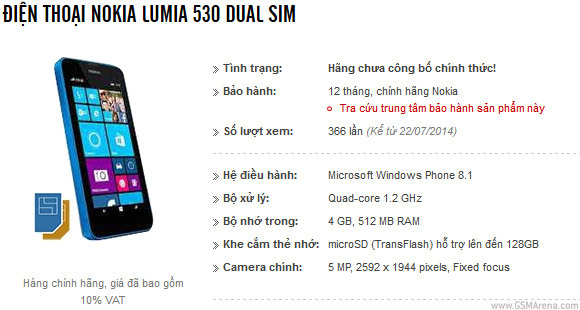 The yet to be announced Nokia Lumia 530 showed up at Vietnamese web shop Mainguyen. The store previously listed the Samsung Galaxy Core 2 Duos and Galaxy Pocket 2 before they were announced and the specs proved very accurate. If the new Nokia Lumia 530 specs are to be believed, the phone will be a fairly minor upgrade over the current Lumia 520. The screen is still 4" big but with 480 x 854 resolution, a minor change from 480 x 800 to bring it to 16:9 aspect ratio. This one will have ClearBlack tech though, which might make a big difference in sunlight legibility. The chipset has been moved to a Snapdragon 200 with a quad-core 1.2GHz processor, presumably Cortex-A7 but could be an A5 too. In either case we're not sure it's much of an upgrade over a dual-core Krait. The built-in storage has been cut in half (4GB) and the RAM is still at 512MB. The Nokia Lumia 530 will reportedly the same 5MP / 720p camera as its predecessor and the same 1,430mAh battery. A compass has been added to the limited sensor array of the Lumia 520, but on the downside the phone grew thicker - 11.7mm, up from 9.9mm. The specs of the site confirm the 530 is a dual-SIM device (the FCC already certified it). It will be available in Grey, White, Orange and Green. The image on the product page shows a blue phone, so it's either a placeholder image or there's one more color option. Keep in mind those specs might be wrong, previously we were seeing rumors of a 4.3" screen. However the dimensions from the FCC match with those of Mainguyen – 119.7 x 62.3mm, practically the same as the Lumia 520 so chances of a bigger screen are slim. Heck ... !! EVERYTHING ALWAYS shows up early in "Nam ! We did in '67-'68 and for the second dance card in '69-'70. Was a great Gig. You guys should have been there .. ! Free balloons, party favors the works! As far as the price of the Nokia Lumia series, they priced the L63X series equal to the 52X series phone presently. So they may replacing the L5xx series with L6xx series. And L5xx series to much less price to catch the lower end device market. The phone is now coming soon in Indian official Nokia site. Hope this one is cheaper than other 52x series phones.